Last month the United Nations Conference on Trade and Development (UNCTAD) released the “Technology and Innovation Report 2011: Powering Development with Renewable Energy Technologies.” The study details the amazing strides made by renewable energy in recent years, even despite the global economic downturn, and states its potential in the developing world. 05 Dec Is shale gas a threat to the development of biomass energy? Shale gas has the potential to revolutionize the world energy market. The United States has lead the way in the extraction of this fossil fuel with the increased utilization of a controversial technique called hydraulic fracturing, or fracking. As a result, in the last decade the country’s production of shale gas has jumped twelve-fold to 4.9 trillion cubic feet. Previously an importer of liquefied natural gas, the United States may soon become an exporter. Due to the viability of exploiting shale gas, the nation’s conventional and unconventional natural gas reserves have risen to 2,552 trillion cubic feet—equivalent to Kuwait and Iran’s combined proven oil reserves. South Korea aims to become a major player in internationally traded biomass over the next decade. Its renewable portfolio standards have legislated that 2 percent of the country’s energy come from renewable sources in 2012, to be raised incrementally each year until reaching 10 percent in 2022. Additionally, 350 of the country’s largest firms have been instructed to reduce their emissions of carbon dioxide. The policy will supplant the current feed-in tariff scheme currently in effect. In contrast to the rest of the world, Sub-Saharan Africa is expected to increase the number of its residents dependant on wood-based biomass energy over the next 20 years according to a report released this month by the World Bank, titled: “Wood-Based Biomass Energy Development for Sub-Saharan Africa.” This is due to the region’s rising population, urbanization, and to the inadequacy of power grids to meet these demographic changes. The World Bank estimates that 81 percent of households in the Sub-Saharan Africa rely on solid fuels and that most of this is consumed for cooking. The key to Africa’s continued utilization of biomass resources, however, is sustainability. Here the World Bank has identified several areas for development. 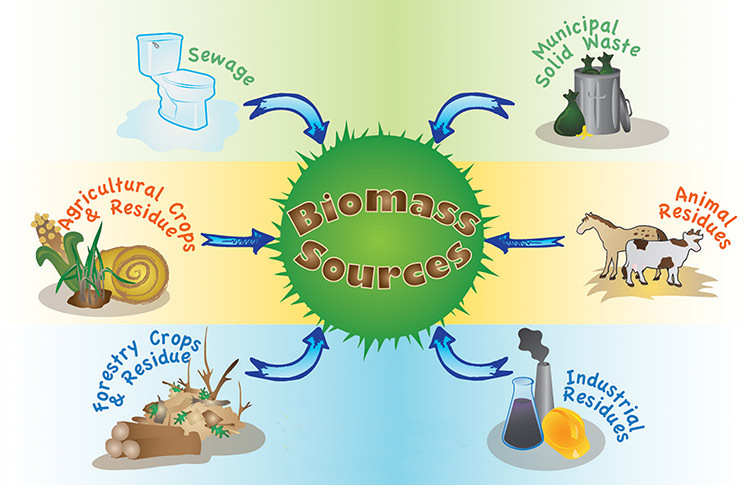 The best aspect about biomass energy is that it can be made from almost anything. Some are more intriguing than others and, at times, even surprising. Listed below in descending order of this humble author’s subjective preferences are the top five most unique sources of biomass energy. Enjoy. Few countries rival Brazil in terms of biomass energy potential. The country has the second largest forested land area, behind only Russia. Because of this, and due to the nation’s favorable climate and topography for agriculture, nearly thirty percent of Brazil’s energy is derived from biomass sources. Sugar has long been converted into ethanol with its by-product, bagasse, then used to make steam and electricity, largely for industrial purposes. More recently, oil seeds such as soybeans have been used to make biodiesel. Increasingly complementing these in Brazil is another promising fuel source, highlighted in an International Energy Agency report released this year: eucalypts. In only five years, China has come a long way in generating power from biomass energy sources. The country’s first biomass power plant came online only in December, 2006—the RMB 340 million Shanxian plant in China’s Shandong province. Since then dozens of other facilities have been commissioned. Biomass materials, particularly from agricultural wastes, are abundant as farmers are often able to receive higher prices for the residuals of their harvest at these new power plants than they are for the crops themselves. Although profit margins at these biomass plants remain slim, rising environmental concerns—as well as a nationwide push toward the application of more advanced technology—have prompted government subsidies to expand China’s power base. Many countries have ambitious plans to increase the amount of energy produced from biomass sources. The European Union’s target to derive 20 percent of its energy from renewable sources by 2020 could require an additional 40 million dry metric tons annually for the generation of electricity. Add on to this another 60 million tons per year for heating and cooling. In the United States, legislation has been passed requiring a quarter of all national energy to be supplied from renewable sources, including biomass, by 2025. Japan is expected to incorporate more biomass into its energy mix in coming years, particularly after its recent troubles with nuclear energy at the Fukushima plant. Then there is South Korea, which has approved a new Renewable Portfolio Standard targeting 10 percent of its electricity from renewables such as biomass by 2022. The measure could raise South Korea's consumption of biomass pellets to five million tons by the end of the decade.